Allow me to tell you about my latest invite design, a "wild" little project I've been working on for quite some time now. I wanted to get it just right before I released it on Etsy, and I'm truly delighted to show you the finished product! 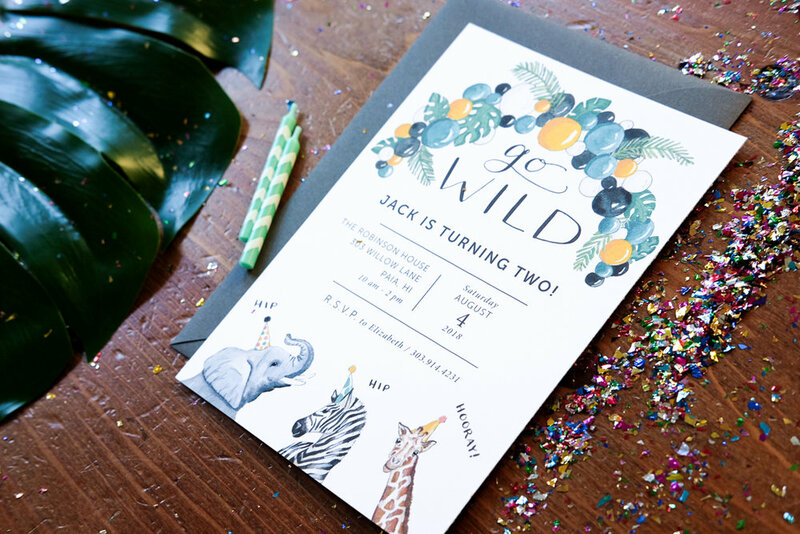 Here is my Jungle Safari Party Invite, as captured beautifully by my photographer sister, Heidi. I want to give a shoutout to Heidi, whose photography niche includes documenting creatives and small business owners. 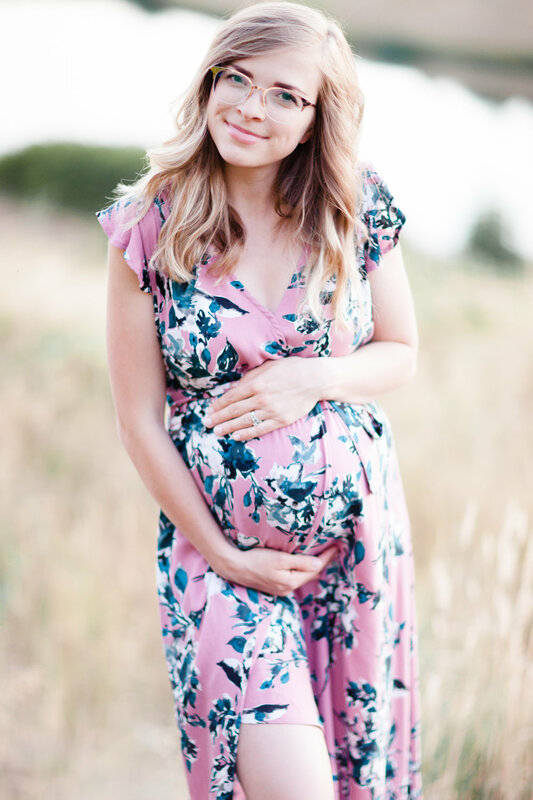 Although this image was just a quick snap in the middle of my own maternity photoshoot (more on that later! ), Heidi offers full photo sessions for creatives and entrepreneurs who want to showcase their workspace, process, products, or services. If this is you, and you're local to Seattle, check her out! Even the camera-shy artist will feel at ease with Heidi behind the lens. 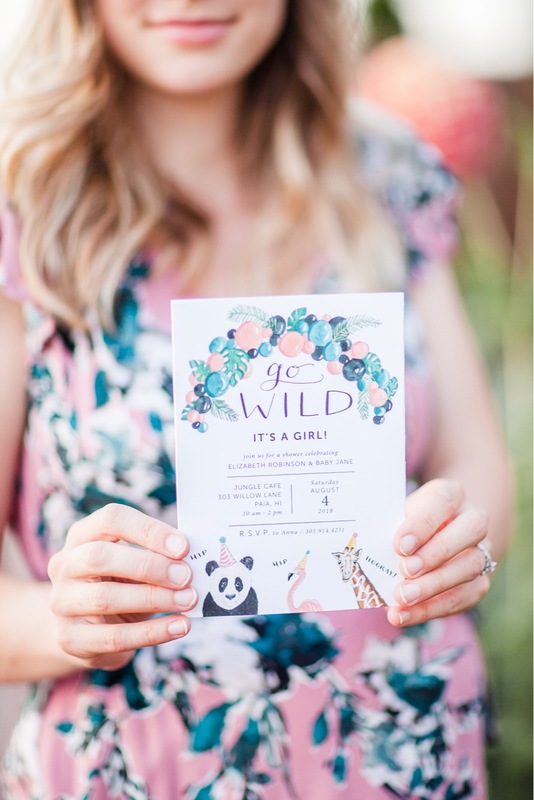 Send her a note to Heidi at heidiannephotography.com and get those photos you've been wanting for your blog, website, Instagram, storefront, you-name-it! Oh, and mention this post for 20% off your session [for creative/business sessions only]. You order the design on Etsy and send me all of your event details. I customize the design for you and send you print-ready, high quality files. 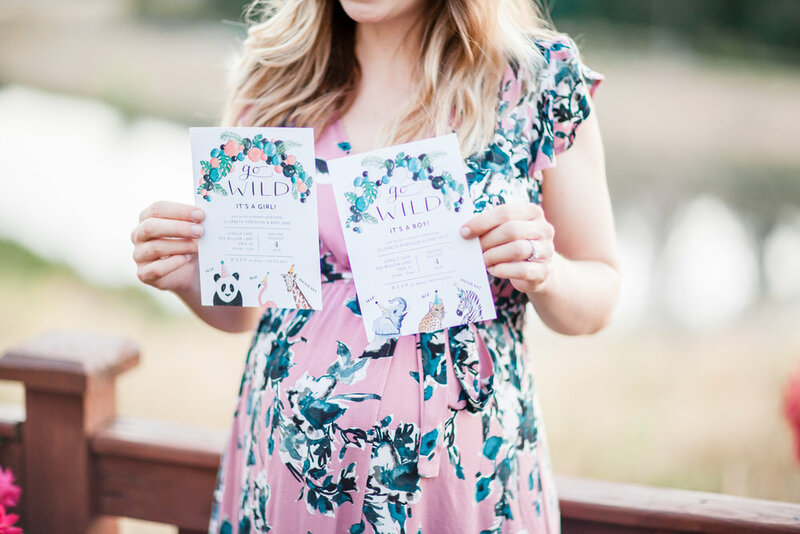 You print the invitations at home, via an online printing company such as VistaPrint, or visit a local print shop. 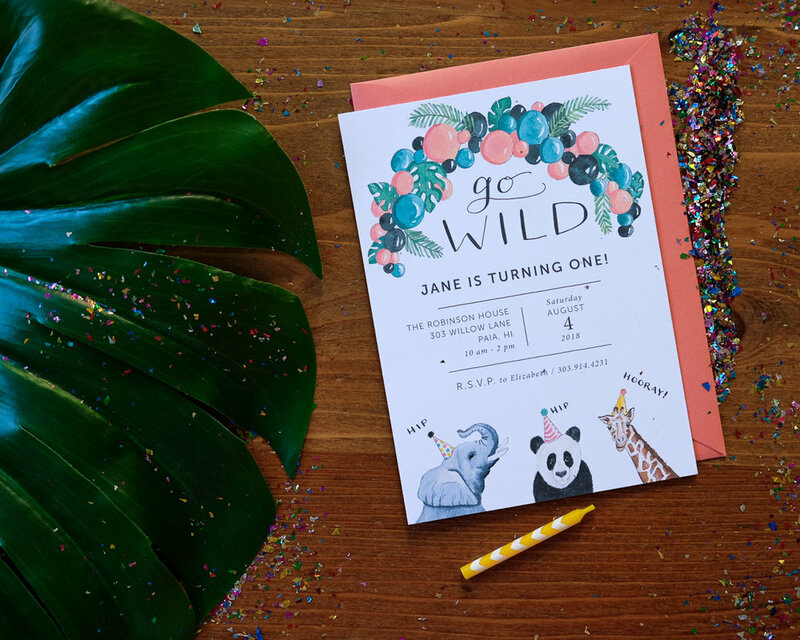 Etsy is a great place to go for printable designs, but most of the invitation options out there have graphics that were designed on a computer, as opposed to hand-drawn. All of the illustrations in my designs were painted by yours truly using watercolor and gouache paints, and the lettering was hand-done, too. This means that when you print on a good quality cardstock or textured linen paper, the finished product looks, as one customer put it, "like art"! This is a versatile design. You get to decide whether you want the "birthday" or "baby shower" version, pick your balloon arch color (coral, white, or yellow) and choose your favorite 3 (of 6) party animals! And now for a few of those maternity pics, just for fun! 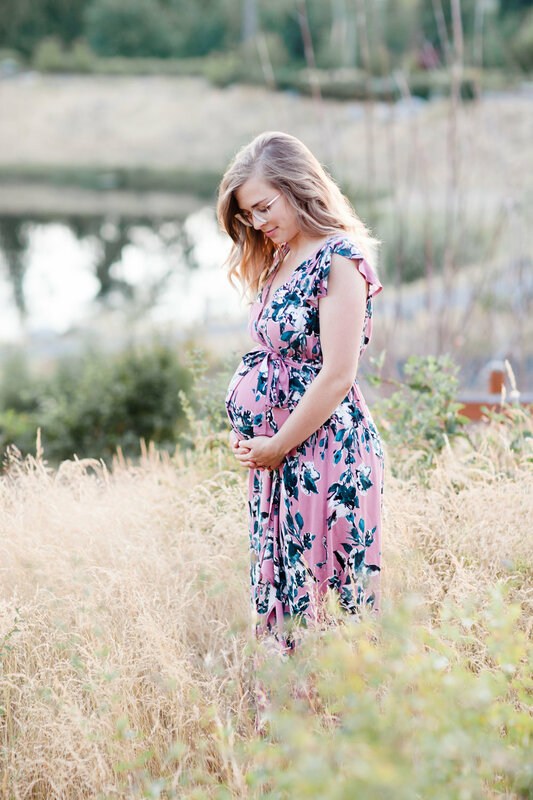 I snagged this dress at a maternity consignment shop, and we stepped outside my sister's backyard to get these shots. Heidi perfectly captured the dreamy look I wanted for this sweet girl. We can't wait to meet you, babe!